Sometimes credited as Willi Ninja or Willy Ninja,William R. Leake was born in Queens on April 12, 1961, and grew up in Flushing. He began dancing at 7. By the early 1980’s he was vogueing in Washington Square Park in Greenwich Village and at drag balls throughout Harlem. He prided himself on being a clean, sharp dancer, with swiftly moving arms and hands, and he was deeply inspired by the martial arts — hence his adopted name, Ninja. 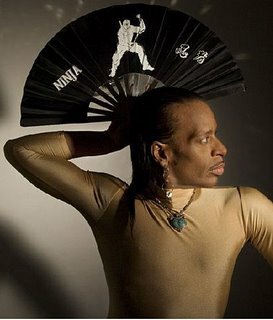 As the “mother” of the House of Ninja — part dance troupe, part surrogate family — he became a New York celebrity, known as much for his quick wit and sharp tongue as for his darting limbs. His ensembles — a coat made of braided synthetic hair, a suit jacket with a skirt and Doc Marten boots — also turned heads wherever he went: “severe” is the word. An androgynous, self-described “butch queen,” Willi Ninja taught vogueing throughout Europe and Japan, modeled in runway shows for the fashion designers Jean Paul Gaultier and Thierry Muglier and danced in music videos. He also taught models how to strut, giving stars like Naomi Campbell pointers early in their careers. Most recently, he worked with the socialite Paris Hilton, whose red carpet sashay has since become her signature. In 2004, he opened a modeling agency, EON (Elements of Ninja), but he never gave up dancing, appearing on televisions series like “America’s Next Top Model” and “Jimmy Kimmel Live,” and dropping in at local clubs. Willie Ninja passed away on September 2, 2006.